HDYDI Parenting Link Up Party | How Do You Do It? On April 28, the How Do You Do It? Parenting Link Up combined with Twinkly Tuesday. Head on over for current link parties. 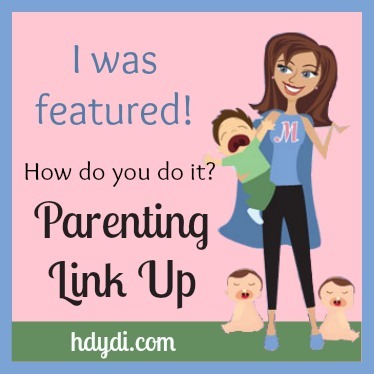 How Do You Do It?‘s parenting link up party is an opportunity for you to share your posts with other parent bloggers and to see what other parents have to share. Tell us how you do it. How do you handle pregnancy, prematurity, birth, and postpartum recovery? How do you handle tantrums, diapering bills, stress, potty training? How do you handle education and special needs? How do you balance the needs of several children with a marriage? How do you handle being a stay-at-home mom, a working mom, or a single parent? How do you find time for yourself? Each HDYDI parenting link up party accepts new links from Monday morning through Friday at noon. The next week, a handful of posts from the party will be featured on How Do You Do It? All pinnable posts will be pinned to our Link Party Pinterest board. Link 1-3 great parenting posts above! Please, no recipes posts! Of course, link directly to a post, not your main page. Put How Do You Do It?‘s Parenting Link Up badge on your site! Put it in your side bar, at the bottom of the post you shared, or on a party page! And if you are featured, grab a featured post badge for your site. By adding your link, you give How Do You Do It? permission to feature your post, if chosen, on the HDYDI site and social media platforms. You also give us permission to invite you to participate in future link ups by email. Was your post featured by the How Do You Do It? Moms? Grab our badge and let your readers know. Again, we have a couple of size options. Pingback: How do you do it? Parenting Link Up #4 - How Do You Do It? Pingback: How Do You Do It? Parenting Link Up #5 - How Do You Do It? Pingback: How do you do it? Parenting Link up #6 - How Do You Do It? Pingback: How do you do it? Parenting Link up #7 - How Do You Do It? 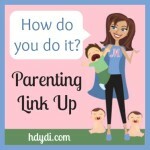 Pingback: HDYDI Parenting Link Up #8 - How Do You Do It? 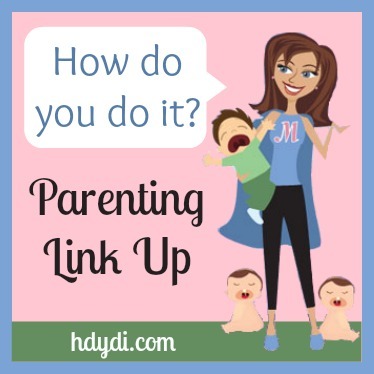 Pingback: HDYDI Parenting Link Up #9 - How Do You Do It? Pingback: How do you do it Parenting Link Up #10 - How Do You Do It? Pingback: How do you do it? Parenting Link Up Party | What's up Fagans? Pingback: How do you do it? Parenting Link Up #11 - How Do You Do It? Pingback: How do you do it? Parenting Link Up Party #12 | What's up Fagans? Pingback: How do you do it? Parenting Link Up #12 - How Do You Do It? Pingback: How do you do it? Parenting Link up Party #14 | What's up Fagans? Pingback: How do you do it? Parenting Link up #15 | What's up Fagans? Pingback: How do you do it? Parenting Link Up #16 | What's up Fagans? Pingback: How do you do it? Parenting Link Up #17 | What's up Fagans? Thanks for hosting. I’m following a link above for no screen time ideas since we give up the television every year as part of our Lenten sacrifice. You’re welcome! Thank you for linking up again!